Located in Hualalai, a resort community on Hawaii's Kona coast, this home is a vacation gathering spot for a extended family whose members live on opposite coasts of the mainland. Comprising a main living pavilion, two smaller wings and a separate cottage, which together form a central court, the house is designed to serve three adult couples, and guests. The idea of Makai - towards the ocean - and Mauka - to the mountain - inform the Hawaiian sense of place in fundamental ways. 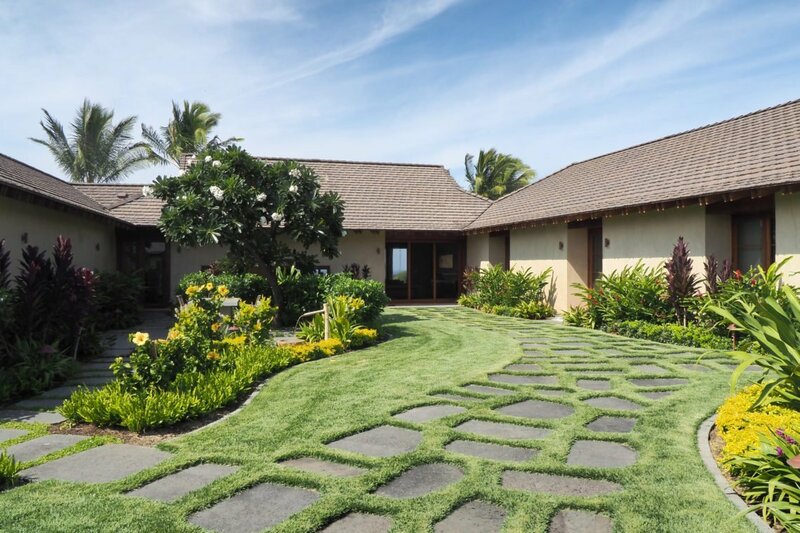 With views to each, the Pacific to the west and Mauna Kea to the east, we sought to develop a site plan and home design that fully weaves indoor and out, engages with the monumental landscapes of mountain and ocean while also recognizing the importance of the small scale landscape and intimate garden rooms. The design provides a range of spaces integrating interior and exterior rooms. Some with breath taking views, others that are more immediate affording quiet and repose. This constellation of spaces - indoor and outdoor - also allows for the ebb and flow of privacy and gathering in a fluid and easy pattern.